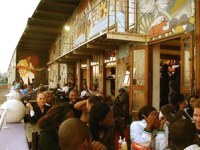 On the Victoria Embankment, beside the Durban harbour, is a haven for artists and musicians known as the BAT Centre. The name is an acronym for Bartle Arts Trust, the organisation that helped to found the centre. The centre features a studio where traditional artists can work; a hall that hosts concerts, conventions and festivals; exhibition galleries; a music store and drum shop where handcrafted wooden drums are made; and a restaurant serving authentic African dishes from all over the continent. There are stunning views of the harbour from the restaurant deck, which hosts live jazz music on Sundays. Nearby is the Maritime Museum, which details the history of the harbour and houses a restored tugboat and other interesting exhibits. The area is well worth a visit for tourists and is popular with locals too. The BAT Centre is close to bus and taxi routes, and the area should be safe to stroll around during the day. But if you are going at night, it is best to take a taxi or drive as the area isn't safe to walk in after dark. It is best to check what exhibitions and live shows etc. are on before visiting the BAT Centre as things can be rather sporadic. Check the official website listed below for details.